PowerPoint is well known presentation tool. Many users may want to convert the Office PowerPoint presentation in .ppt format to a video for easy sharing on websites or send to others via e-mail attachments. However, converting and saving PowerPoint presentation files complete with sound and music into video format without third-party tool (except PowerPoint 2010 which has save presentation as WMV video feature). The Wondershare PPT2Video can help users to convert their file into multiple formats so that user can share and demonstrate presentations easily with others. PPT2Video is a powerful PowerPoint to video coversion tool that creates video file in formats such as WMV, MKV, MOV, and ASF video. It perfectly turns PowerPoint presentations to video movies which enable users to share and show presentations on trade show, digital signage, in-store displays and portable devices as video podcast with its original animations and sound effects in high-quality. PPT2Video features ability to keep the exact PowerPoint animations, transitions, sound tracks, video clips and even the inner hyperlinks, PAL and NTSC TV mode support, and selection of resolutions to fit different screen size when converting presentations to video. The Wondershare PPT2Video is available in two versions – Free and Professional. Different among Free and Pro version is the Pro version able to convert up to 12 presentations at one time while the free version just can convert one PowerPoint file at one time. 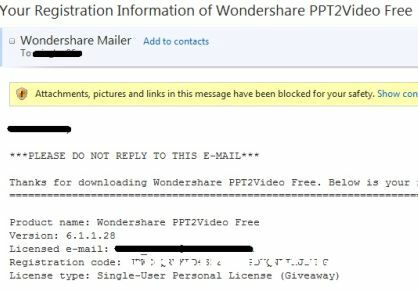 The developer Wondershare is now having a promotion to allowing everybody to get a free version copy of Wondershare PPT2Video. Fill in the form by entering the name, email address, and then click “Get KeyCode” button. Email from “Wondershare” will be sent to registered email with registration code. Then install it and enter registration code to enjoy the fully licensed Wondershare PPT2Video.